The Caracaras are referred to as the tropical version of a vulture but classified into the Falconidae family. They can be thought of as a bird of prey with a scavenging behaviour that distinguishes them into their own genus. Caracaras feed on insects, fish, reptiles, birds, amphibians and mammals (small and occasionally large vertebrates) and also high jacking nests to savour eggs! As scavengers, caracaras tastefully have bites on carrion of all types. 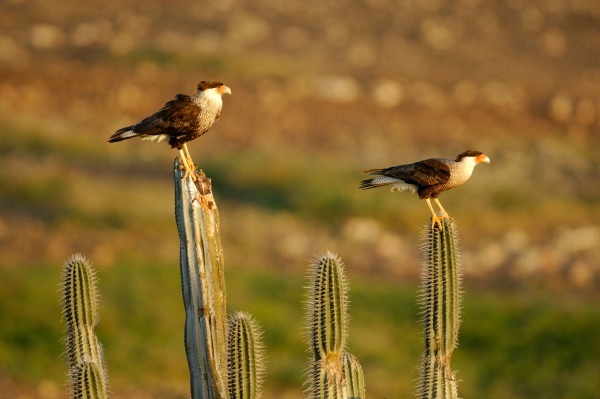 Did you know that originally Polyborus plancus was the scientific name given to the Crested Caracara? Through field observations, differences were noted splitting the species into two and classified into the genus Caracara: the Northern Caracara (C. cheriway) and the Southern Caracara (C. plancus). The C. cheriway is commonly known as the Northern Caracara and it expands its range into the ABC islands. Slightly smaller than the Southern Caracara, its Northern cousin is an open country species ranging in pasturelands, cultivated areas, semi-desert and both in arid and moist habitats. They seem to prefer the hard conditions in the arid to semi-arid habitats. They nest on trees and can be seen soaring graciously. 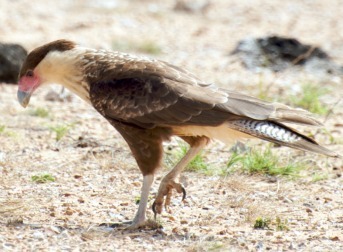 The Northern Caracara is sometimes referred as the ‘Mexican Eagle’ as it is also part of the local folklore and legend. This species is under the “least concern” IUCN category as its extant population is thriving throughout North America (from Southern USA) down to South America (as far a Peru) and present in some Caribbean islands as well.